If the salt solution acts as a chemical replacement medium we would assume a uniform effect. The result of this fossilization is chaotic and non uniform. Not at all the result you would expect from thousands of years of immersion. If we consider a cosmogenic lightning or even electric tectonic effect then the variance becomes explainable as the discharge leaps to sights of higher condctance ( if thats the word I'm looking for ,oris it lower impedence-- my electrical knowledge is a bit rusty). It does seem problematic that there would be so many colors in the tree rings and hearts of petrified wood, if there is just a chemical solution and replacement at work. Maybe this map would provide some good places to look for fossils? Kurra-kurran, the name of a place in which there is almost a forest of petrifications of wood, of various sizes, extremely well defined. It is in a bay at the north-western extremity of Lake Macquarie( near Sydney). The tradition of the Aborigines is that formerly it was one large rock which fell from the heavens and killed a number of blacks who were assembled there; they had gathered themselves together in that spot by command of an immense iguana, which came down from heaven for that purpose; the iguana was angry at their having killed lice by roasting them in the fire; those who had killed the vermin by cracking them, had been previously speared to death by him with a long reed from Heaven! At that remote period, the moon was a man named Pontobug; and hence the moon is called he to the present day; but the sun, being formerly a woman, retains the feminine pronoun she. When the iguana saw all the men were killed by the fall of the stone, he ascended up into Heaven, where he is supposed to be now. This site of petrification and its assosciation with a mythology that points to some sort of cosmological event . As Shoemaker levy 9 shows a flash impact may well be the cause of petrification. I winder if the Tunguska site has any petrification assosciated wit it ????? * That's an interesting idea about the Bible's description of Lot's wife turning into a pillar of salt near Sodom meaning she was fossilized. It sounds similar to the 1950s leg fossilized inside an unfossilized cowboy boot. Medusa was said to turn people to stone when they stared at her. I wonder if that meant she fossilized them. At http://www.kronia.com/thoth/ThotII20.txt Dave Talbott said Medusa was the planet Venus, seen in the center of Saturn's face during the Saturn age. It's hard to imagine that Venus could have fossilized people etc when it was in that position. Perhaps lightning was seen to come from Venus to Earth at that time. * In Kronos magazine in the 80s Dwardu Cardona apparently identified the myth of hurakan as referring to the polar plasma column, as per: https://www.thunderbolts.info/forum/phpBB3/viewtopic.php?f=10&t=1293&sid=646d136b790d2f5c46e5d3ebfcfd853e. Kurra-kurran might mean the same thing. * The iquana might mean the planet Mars, since it was seen to go up to Saturn and come down close to Earth in the Saturn age. The spearing of people was probably lightning. The long reed may have been the polar column, or more lightning. * The Moon probably came from orbit around Saturn or Jupiter. The Sun probably meant Saturn as Saturn was considered both male and female, while our present Sun is generally considered male, if anything. Saturn was the sun in the Saturn age. What do the Aborigines say about the 1500 AD event you mentioned earlier? But why would the tree rings often be the same color? You see the red mineral replaced the rings all the way to the heart of the tree. If this is ground water trickling its way through the tree cells, the imurities that resulted in the red color seemed to only "like" certain types of cells. It is fun to step back and get the bigger picture. If it is alright with the moderator, I transcribed this beautiful description of the petrified forest just north of where that picture was taken. Among the lofty deserts of the Colorado Plateau there is a unique primeval forest--although the word forest does not entirely describe it. When I first saw the place, I had the impression that giants had plucked up trees by the handful, like weeds, and dropped them on the ground. Their trunks, often piled haphazardly one on the other, covered the desert floor as far as the eye could see. The thick roots and branches of the trees were all broken off, and even most of the trunks were smashed into chunks of different lengths. The ground among the trunks was littered with scraps of wood of every size, and with bark in which the tunnels of wood-eating insects could be seen. In some of the tunnels there were still beetles and larvae. Although not a soul was to be seen far and wide, the forest looked as if it had just been felled. You imagined that you could still hear the growl of chain saws and the blows of axes. In fact, total silence prevailed, except for the occasional slight rustling of the desert wind among those mighty stumps. The whole scene had something ghostly and weird about it. The mood in that felled forest was like the atmosphere on the day after a natural catastrophe. But the most extraordinary thing about these shattered forest giants was that all of them without exception, including the scraps and bark, were made not of wood but of colored precious stones, agate, chalcedony, opal. The gems gleamed in the loveliest of colors, especially along their planes of fracture. The trees are 200 million years old. They date from the Triassic period of the Mesozoic era. Before they were uprooted by some storm or flood, saurian grazed among their trunks. As the fallen trees lay buried for 200 million years, ground water trickled through them. The minerals in the water filled the cells of the wood, petrifying the trees and preserving them down to the present. Because petrified wood loses its elasticity, the trees were splintered by the movement of the rocks in which they were embedded. Many saurian skeletons also have been preserved in nearby rock formations. …In the midst of one of the driest wastelands of rock on earth, I stepped into the footprints of an animal that could have lived only in a humid, tropical climate where vegetation grew lushly. I toured the Petrified Forest in Arizona twice... Uwe George's description is entirely suitable, albeit poetic. What drives some minerals to collect/form in particular places in the wood? cross sections are generally consistent from "pith" to "cork", but sections along the stem are patchy. I also have sections of diatomaceous opal which clearly show mineralization growth from the inside out, but this is a different process from wood. Back to the Arizona samples, elements found within the particular regions of the wood undoubtedly affected the mineralization process in some way, or perhaps fractures in the petrified sections allowed for the entrance of minerals, eg iron oxides, etc, after initial petrifaction? Eureka - How Trees Fossilized! * I just read something that gave me an idea how petrified wood formed in more detail. * I read that "The predominant minerals in petrified wood are silicates, such as quartz." * It says that minerals can seep into pieces of wood in hot spring water and petrify it in 7 years or more. Not all the minerals in petrified wood are quartz. They can be calcite, magnesium, potassium, carbonates, silicates and many others. That's where all the different colors come from. What Minerals Are In Petrified Wood? 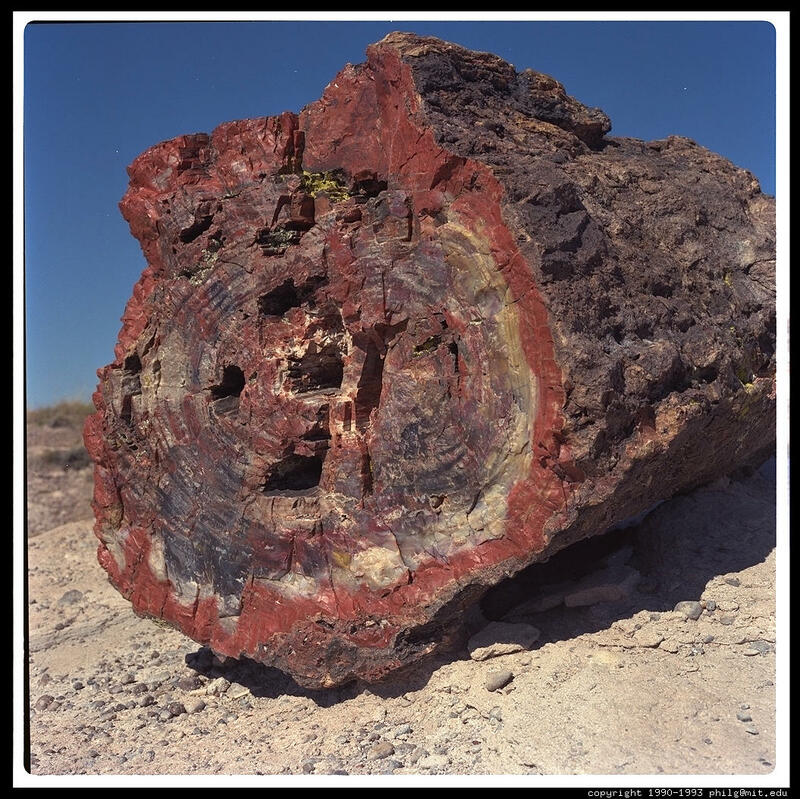 The mineral content of petrified wood is easily identified using a mass spectrometer or X-ray diffraction technology. Silica, in the form of silicon dioxide (SiO2), commonly known as quartz, is the most common replacement mineral. 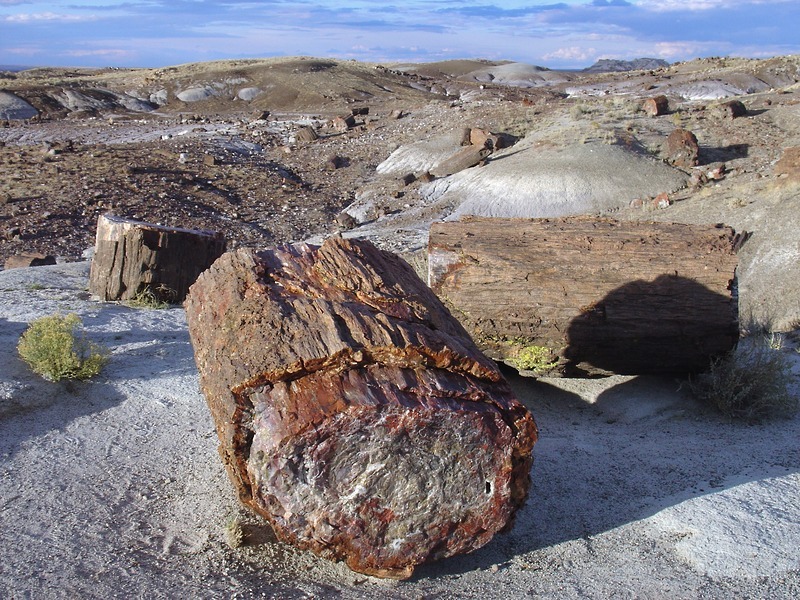 Often traces of other minerals give petrified wood its unique color and characteristics. Iron oxide will cause reds, browns, yellows and earth tones. Copper and chrome oxide create greens, silicates of aluminum produce whites, and manganese dioxide makes black. * The silicon in petrified wood seems to be like glass, which may mean that the silicates melted, which would have required considerable heat, which electric discharges could provide. 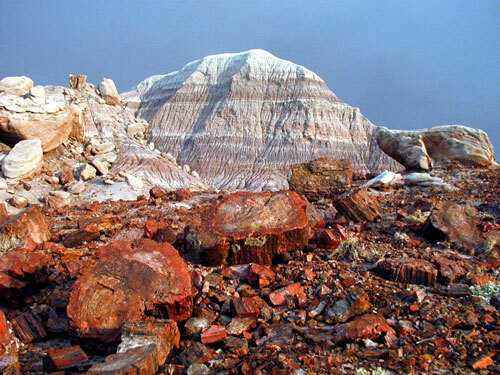 This place is called the petrified forest, as it was once believed that the trees that grew here turned to stone. The truth is probably close to that,a grove of old Moonah trees have become encased in limestone. I liked your cowboy boot a lot Lloyd! The other fossils in the same link were also interesting, if they were electrically formed. Since this is MGmirkin's thread, he would probably consider that source anecdotal, and want to see it in a scientific publication. But, it brought up the whole subject of soft tissue fossilization. To make sense of the surprising discovery, scientists are beginning to rethink a long-standing model of how the fossilization process works...Traditional ideas of how fossils form do not allow for the preservation of soft, perishable organic tissues. So I am asking, if fossilization happens by some electrical process, and there is transmutation, doesn't that fit the picture here more closely? It would seem to explain how the outside of the bone could be instantly changed to stone, but the inside may still have soft tissue. And look, MGmirkin already has that link on page one! Wouldn't that be interesting if the bone was fossilized and the soft tissue was dehydrated all in one "swell foop"? Wouldn't that be interesting if the bone was fossilized and the soft tissue was dehydrated all in one "swell foop"? * What's a foop? But, yes, that would be interesting. Is it interesting to think that the Great Flood knocked over and submerged forests for 5 months [the Bible says 150 days, I think] and the hot water helped the wood absorb minerals stirred up in the flood waters, which resulted in the color variations in petrified wood? Lloyd said, Is it interesting to think that the Great Flood knocked over and submerged forests for 5 months [the Bible says 150 days, I think] and the hot water helped the wood absorb minerals stirred up in the flood waters, which resulted in the color variations in petrified wood? That's it? Just hot water with a high silica content? No transmutation of carbon to silicon, turning saurians and trees instantly to stone? No "iguana" shaped plasma dischages and prolonged electrical arcing over huge forested regions? You guys are too straight for me. Fabulous links, Lloyd. I just love it. It has been fun. Just hot water with a high silica content? No transmutation of carbon to silicon, turning saurians and trees instantly to stone? * You misunderstood. The hot water didn't bring in silica; it brought in the minerals that give the various colors to the petrified wood. Electric currents and heat still would have transmuted the carbon to silica, but, if it was under water, the current may have been dispersed and may have taken longer than instantly. It may have taken a few months, since that seems to be how long the flood waters remained. * I believe the TB team has not been able yet to determine how many catastrophic episodes there were and how long each one likely lasted during the breakup of the Saturn system. So the exact sequence of flood and widespread megalightning is probably not yet certain. * And my question about foop was rhetorical.